I . simply . adore . these . little . bites ! And what’s not to adore? After all, we’re talking about little bite-sized pieces of roasted sweet potato with a savory combination of herbs and just a hint of spicy heat. These are a definite must-make recipe, whether you’ve decided to Join Us for the Whole30 or not. That’s because these tasty little bites make the perfect side dish for virtually any meal … roasted chicken, burgers, a hearty steak … and more! Oh, and be sure to make extras for creating lots more quick-n-tasty meals! Add them to your favorite cauli-rice bowls, salads, and egg scrambles. Your taste buds will thank you! But scrumptiousness aside, sweet potatoes provide excellent nutritional benefits as well, since they contain antioxidant, anti-inflammatory, and disease-fighting components. Most of these benefits are a result of the large amount of beta-carotene found in sweet potatoes, which helps ward off free radicals that cause chronic diseases. This important antioxidant also helps to support the immune system and reduce inflammation. And when it comes to carbohydrates, sweet potatoes provide a healthy dose of those as well. What? Carbohydrates are healthy? Why, yes, it’s true! Carbs are an important part of a healthy diet – when they come in the form of real whole foods that is. In fact, the Whole30 team has remarked in their book, “It Starts with Food,” that we shouldn’t be afraid to eat high-carbohydrate veggies like sweet potatoes, pumpkin, butternut squash, beets and parsnips. This is especially true for those of us who are active, and/or have high metabolisms. Yet, even if you’re trying to lose weight, you shouldn’t be skipping out on enjoying modest portions of healthy carbohydrates either. Veggies like these are a much-needed fuel source that also provide a delicious dose of good nutrition! So, there you have it … sweet potatoes are not only delicious, they’re an excellent way to add some nutrient-dense carbs to round out your diet, whether you’re following The Whole30 Program or not. And this recipe for Roasted Herb Sweet Potato Bites is a guaranteed family pleaser! Three cheers for an easy and tasty way to enjoy this nutritious and delicious orange veggie! Yum! Preheat oven to 425 degrees. Wash and dry sweet potatoes. Leave skins intact, and cut potatoes into bite-sized cubes. 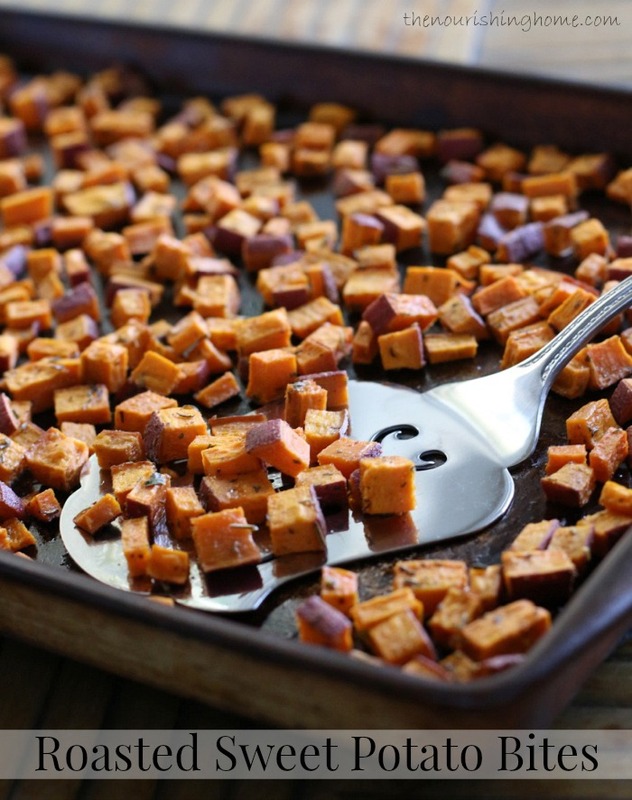 In a large bowl, or gallon-size ziplock baggie, combine all ingredients, except the cubed sweet potatoes. If using a baggie, rub the bag between your hands to combine the ingredients and evenly distribute them throughout the bag. 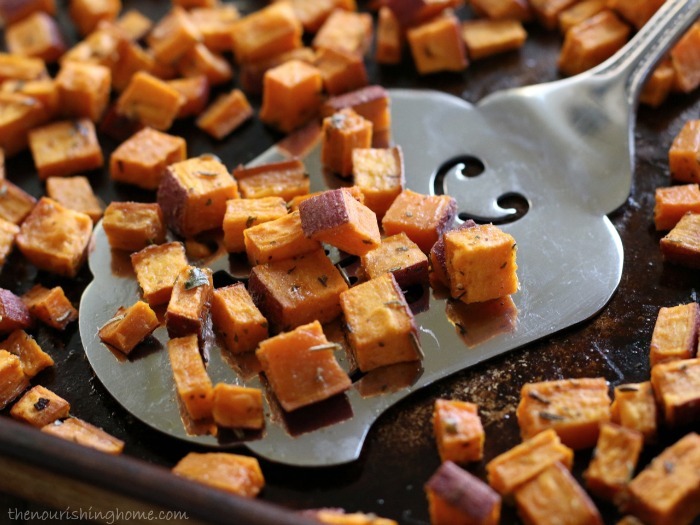 Place sweet potatoes in the bowl (or bag) and toss well to coat. Place on a large-rimmed baking sheet and bake for 20-25 minutes until lightly browned and cooked through. Disclosure: Some of the links in this post include affiliate links, providing The Nourishing Home a small percentage of the sale at no additional cost to you. Of course, you are not obligated to use these links to make a purchase, but if you do, it helps to support this site and ministry. Thank you! I think this would make a perfect side for baked chicken. Very versatile too. I could easily see adding some parsnips, radishes or carrots into the mix, maybe even some Brussels sprouts. Thanks for sharing, Kelly. This looks great – I’m off to get a sweet potato today. Nutritionally I tend to lean to sweet sweet potatoes over potatoes, though they both have a fair nutritional profile but somehow sweet potatoes are that much more flavoursome !! I am thinking that it might be a good idea to make up some of the seasoning mix in a jar, its very similat to the slow cooker chicken seasoning and herbed roast veg seasoning I see – so making a bit up might save time. I am about to refer the team to this recipe too. Just made this tonight and it was amazing! 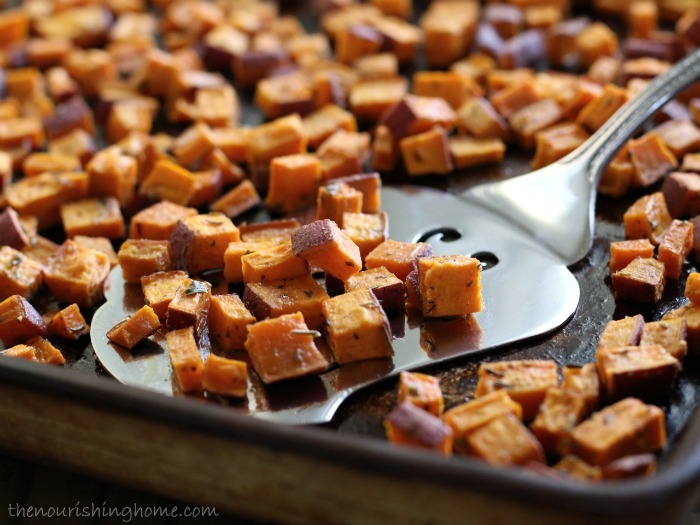 My hubby usually doesn’t like sweet potatoes because of the sweetness but he loved the spicy kick of these! We will be making these again and again! Thanks for sharing the recipe! These sound amazing! I’m pinning them right now to make later. So, so good!! Thank you for the yummy recipe- these were a hit with the fam! These are so amazing and delicious! Yum! And easy, to boot. Thank you for all of your tasty recipes. I’m loving your Whole30 menu. It’s making it so much easier to eat healthy meals. Thanks!